Although Bristol City have played their football at Ashton Gate since 1904 it appears Bristol City football homes future lies elsewhere with discussions underway about a move to Ashton Vale. 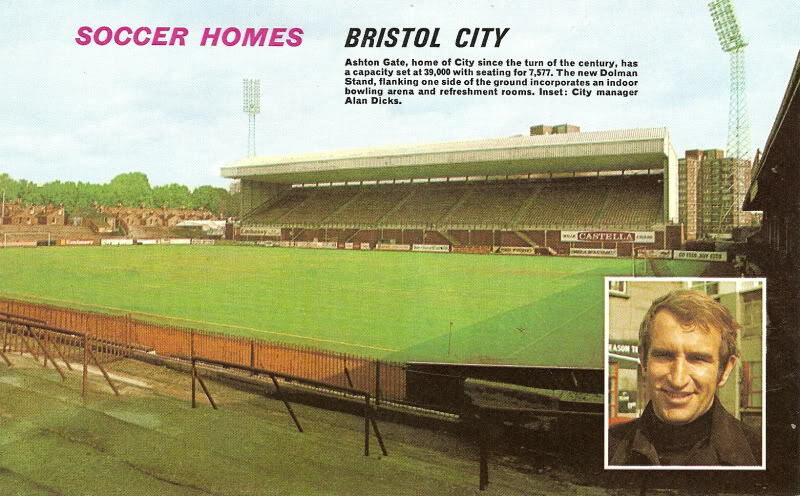 The picture below though, taken from a 1970's Football Review magazine shows Ashton Gate as it used to be. "Ashton Gate, home of City since the turn of the century, has a capacity set at 39,000 with seating for 7,577. The new Dolman Stand, flanking one side of the ground incorporates an indoor bowling arena and refreshment rooms. Inset : City manager Alan Dicks." I have also found an absolutely stunning piece of old film footage on Google that shows the old Ashton Gate ground as it used to be in the 1970s. Older fans will find this brings back some great (and not so great) memories while younger fans who never experienced what these football grounds used to be like might just get a feel for why us "older" fans go on about the "good old days" ! !